Timekpr: for > 11.10 no more available through the ppa. Timeoutd: command line alternative, but from 11.10 removed from the repositories. Gnome Nanny: Looks great but repeatedly crashes to force restarting X-server. So we can't use or recommed this program at the moment. # CALL: Place on Desktop or call from Terminal with "lock-screen-timer 99"
# DATE: Created Nov 19, 2016. Last revision Mar 22, 2018. #       Remove hotplugtv. Replace ogg with paplay. # NOTE: Time defaults to 30 minutes. #       If previous version is sleeping it is killed. #       Zenity is used to pop up entry box to get number of minutes. #       If zenity is closed with X or Cancel, no screen lock timer is launched. #       Pending lock warning displayed on-screen at set intervals. MINUTES="$1" # Optional parameter 1 when invoked from terminal. DEFAULT="$MINUTES" # When looping, minutes count down to zero. Save deafult for subsequent timers. zenity --info --title="Lock screen timer already running" --text="Previous lock screen timer has been terminated." # Running under WSL (Windows Subsystem for Linux)? break ; # break out of timer lock screen loop and end this script. DEFAULT="$MINUTES" # Save deafult for subsequent timers. break ; # zero minutes considered cancel. # Loop for X minutes, testing each minute for alert message. # Record number of minutes remaining to file other processes can read. 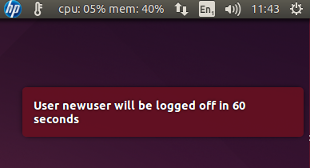 # Call screen saver lock for Unbuntu versions > 14.04.
exit 0 # Closed dialog box or "Cancel" selected. Then toggle back to the empty gedit window and paste the code using Ctrl+V. Save the file and exit the editor back to the command prompt. Set the desired number of minutes and click OK to start the timer. When there are 15, 10, 5, 3, 2 and 1 minute(s) left a system sound is heard and a message bubble appears advising when the screen will be locked. After the screen is locked you need to enter your password to unlock the screen. Nautilus defines what happens when we double click on an executable script when it's the files display window or a link on on the desktop. Normal behavior is to edit the script using gedit. We want to change this behavior such that it is executed. Right click on the file and the context-menu options appear. From the menu select Make Link. A new icon appears called Link to lock-screen-timer. Left click on the new icon and drag it from Nautilus to your desktop. Now you can double click on the desktop shortcut link and the script is run. A dialog box appears to get the number minutes. Two buttons are presented Cancel and OK. If you click the X to close the window it is the same as selecting Cancel. After the timer is running and you double click on it again the first running copy is "killed". You can now start a new scren lock countdown or click Cancel for no countdown. While lock screen timer is running it records how many minutes are remaining into the file ~/.lock-screen-timer-remaining. You can look at this file with the watch command or display it on Ubuntu's system tray / application indicator bar as shown at the top of this answer. To display time remaining in the notification area, follow the instructions in this Q&A: (Can BASH display in systray as application indicator?). When we talk about forcing a user to log off, what we’re really talking about is implementing time restrictions on the account for system access or services. The easiest way I’ve found to implement time restrictions is using a plug-in module called Linux-PAM. Pluggable Authentication Module (PAM) is a mechanism for authenticating users. Specifically, we’re going to use the pam_time module to control timed access for users to services. Using the pam_time module, we can set access restrictions to a system and/or specific applications at various times of the day as well as on specific days or over various terminal lines. Depending on the configuration, you can use this module to deny access to individual users based on their name, the time of day, the day of week, the service they’re applying for, and their terminal from which they’re making the request. When using pam_time, you must terminate the syntax of each line (or rule) in the /etc/security/time.conf file with a newline. You can comment each line with the pound sign [#], and the system will ignore that text until the newline. The first field —  services — is a logic list of PAM service names. The second field — tty — is a logic list of terminal names. The third field — users — is a logic list of users or a netgroup of users. The fourth field — times — indicates the applicable times. These rules restrict user bobby from logging on between the hours of 0800 and 2000, and they also restrict Internet access during these hours. Root would be able to logon at any time and browse the Internet during all times as well. Note: The system logs errors with these rules as syslog(3). With Ubuntu Linux, it is possible to assign to your computer time restrictions, to prevent the connection of one or more users to your system. With the time restrictions, you can, for example, limit access to the computer for your children (a kind of parental control, in short), or even protect the connection to your server during certain hours. GDM is the login screen distributions Ubuntu, Edubuntu and Xubuntu. For Kubuntu, which uses KDE, kdm service is called, it will be the file it will open. And you're done for configuring the PAM! This will enable the control of hours on this service. If you have a server, you probably do not have no GUI. In this case, GDM / KDM not installed and the connection will not be blocked. To prevent connection to TTY, you must modify the login of the same file, and add the same line of code than previously acknowledged. This action also applies to people who have installed a GUI and want to block access to the login screen and terminals. Instead of the user field, enter the login account you want to block. Be careful not to confuse the abbreviations Wk and Wd are misleading! particularly poorly identified on the Internet: you can easily find conflicting information! Connections outside of these hours will be banned. As for users, it is possible to use the operators | and! to indicate several times (the! then indicate that all logon hours are allowed, except those to be shown). Thus, the user marry can not connect to a TTY, 4 and 5 during the weekend. As before, replacing the Minute field schedules and time desired. Then fill in the day (s) by (s) day (s) banned (s), or simply type an asterisk (*) to indicate all days of the week. Finally, change the field used by the login account to be blocked, and voila! jessica can log on Wednesday from 1:00 p.m. to 4:00 p.m.
-> Disconnect: Tuesday at 4:00 p.m..
mathilde is allowed to connect every day from 1:20 p.m. to 3:20 p.m. and from 4:00 p.m. to 8:30 p.m..
-> Disconnecting: Daily, 8:30 p.m. to 3:20 p.m. ET. -> Disconnect (1): Monday, Tuesday, Wednesday, Thursday and Friday, at 18:45. -> Disconnect (2): Saturday and Sunday at 10:15 p.m.. The command skill-KILL-u disconnects the user from the GUI, as well as TTY. It is perfectly usable for server administrators. However, this command is immediate and the disconnection will be made without notice. It would therefore be preferable to prevent the installation of this device users of the computer or network in question! It is possible to prevent users with a wall command launched by cron few minutes before the end of the timeframe, that will be displayed in the terminals of all users. 40 18 * * Mon,Tue,wed,thu,fri stone DISPLAY=:0 notify-send "end of session in 5 minutes"
I've seen around user having problems with Pam and i saw alot of bug about that so Why is the reason??? is so simple Ubuntu 11.10 doens't support GDM anymore the new display manager is lightGDM the problem is the follow where store this directive account required pam_time.so i think is in /etc/pam.d/lightdm or /etc/pam.d/lightdm-autologin but bug how ??? I guess it has everything you need. Limit access time per day per user, easy gui for configuration, abitlity to bypass for a day, add some "reward time", notification of remaining time for users, etc. The project page is here. They also have a PPA for ubuntu which you can add to your Software Sources: deb http://ppa.launchpad.net/timekpr-maintainers/ppa/ubuntu lucid main. And install via Software Center or via CLI: sudo apt-get install timekpr. Auto-logoff is extremely frustrating if you are in the middle of something. It's violent, it's brutal, it's plain rude. And it doesn't matter how old you are. It's one thing when you are just computer addicted and it's very different when you are tracking time and get kicked out 5 seconds before you managed to click that submit button or save your document. I suggest you to consider using an auto-reminder instead of an auto-kicker. That will teach your kids to respect each other and allow each other to use the computer willingly. There's even a lighter alternative. Start by tracking the amount of time that each kid spends using the computer and make the gathered data available for all of them so they can see it. This incredibly simple thing alone (applied to internet bandwidth spent) has saved my life when I was being the network admin in an office full of adults. The public stats about bandwidth usage for each computer (just the amount of bytes, not deanonymizing info like lists of visited sites etc) turned the situation from "me - the evil greedy admin against them - the poor abused office users" to "man, you downloaded 5 times more than me, that's bad!" "sorry, I downloaded indeed, I watched a lot of youtube during lunch breaks, won't do it anymore at this rate" - I was simply excluded from the confrontation scenario. We may need to remove libpam-smbpass to enable user switching until bug #835310 is fixed. All restrictons defined in the application window work as defined in the timekpr GUI. A newer release/fork of timekpr was published for Ubuntu 14.04 by Eduards Bezverhijs in his ppa:mjasnik/ppa. Copy and paste the code into a file called kidtimer.install. # Restrict kids computer access to specific hours and total time. [ "$DOW" == "6" ] && WEEKEND="yes"
[ "$DOW" == "7" ] && WEEKEND="yes"
echo "Kidtimer is now installed. Run /usr/local/bin/kidtimer to configure." [ $DOW -eq 6 ] && W="yes"
[ $DOW -eq 7 ] && W="yes"
ls -l $basedir/time/$I.ttl | grep -q "$Cdate"
echo "Syntax: addtime <user> <minutes|reset>"
echo "New total minutes is "$C"." echo "1) Setup user limits." echo "2) Modify user limits." echo "3) Remove user limits." echo "4) List configured users." echo "Users configured for kidtimer:"
echo "Error. User does not exist. Please create user using the useradd command first." echo "Error. User not setup. Please setup user first." echo "Error. User is not setup." echo "addtime <user> <minutes> ... Increases allowed time for the day." echo "logout <user>            ... Starts logout sequence for user." echo "hourly                   ... Enables/disables user access based on the schedule." echo "daily                    ... Resets time for the new day." echo "help                     ... This list." Setup a existing user account. Allow your kid specific hours of the day to access the computer, both weekday and weekend. Set maximum amount of time, both weekday and weekend. Check every minute to see if user is logged in. If so, increment total time. If hit max time, disable account and start logoff sequence (5 mins total). Check hourly to see if user is allowed to login. If so, enable account. The application uses notify-send to alert user time is running out. When time runs out, all user processes are terminated, so please prepare user. timekpr - This program will track and control the computer usage of your user accounts. You can limit their daily usage based on a timed access duration and configure periods of day when they can or cannot log in. With this application, administrators can limit account login time duration or account access hours. The application works as a parental time control, and will be useful to parents who want to limit child access time. You can update your system with unsupported packages from this untrusted PPA by adding ppa:timekpr-maintainers/ppa to your system's Software Sources. In the output we get the pid of the targeted user, that needs to be halted if the time exceeds the limit. This solution is a small background script. It limits the usage per day to a defined number of minutes, to set in the head of the script. Once set up (which is not too difficult) it runs very easy, and no additional action is needed afterwards. Once per 10 seconds, the script looks if the targeted user is logged in. If so, it "adds" one "point" to a total usage, to be recorded in a file (/opt/limit/uselog). If the daily limit is reached, the script no longer allows the user to be logged in, kills its process if it exists. But you'd need the sudo password to do so. Add time limit in /var/lib/timelimit/user_to_be_limited.limit file with root rights only. e.g. 1800 for 1800 seconds (30 minutes) daily limit. notify-send --icon=gtk-dialog-warning --urgency=critical -t 30000 "$userName" "You have 60 seconds left!" I just made an answer available easily. Code is explained on thread http://forums.linuxmint.com/viewtopic.php?f=213&t=77687 . In short: a limit configured in minutes per day, a cron job every minute, a message to user to keep him informed and a forced logoff. Not the answer you're looking for? Browse other questions tagged software-recommendation bash parental-controls or ask your own question. How can I set computer usage time limits? Is there any “windows-family-safety”-like feature available in Ubuntu? Is there anything like Nanny that's still being developed? Which Time Tracker application do you recommend? How to stay productive? What time management software is available? How do I block everything on a user account, except Firefox?